With a Table Mountain, a spectacular seafront, an array of stunning “blue flag” beaches, and the colourful houses of its Bo Kaap locality to top it all, Cape Town is without doubt a tourist’s paradise. Here are 6 interesting facts about Cape Town that you may not have heard before! 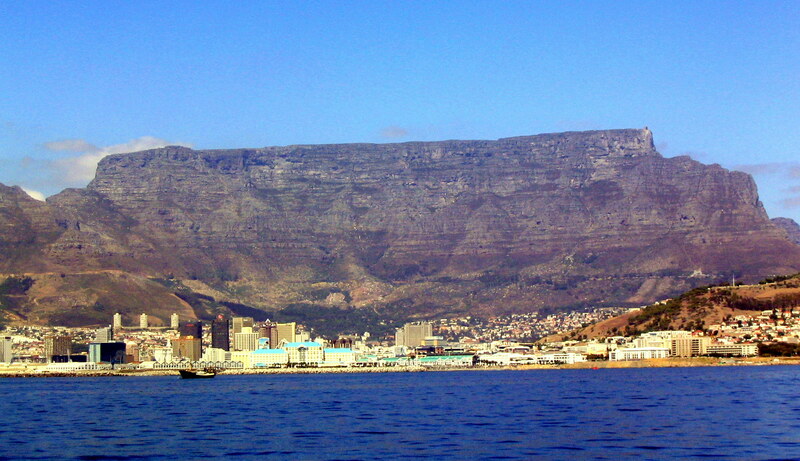 * For a city of its stature, Cape Town is relatively very less dense. This means very less people live in it per square kilometre compared to other major world cities. How less? If you took the effect of area into account, there are 13 people in Mumbai for every one person in Cape Town! * Cape Town does indeed have this knack of lapping up award after award. Can you guess how many internationally acclaimed recognitions and awards it has received in the past 2 years? Five? Ten? The correct answer is 22. ‘ One Of The World’s 5 Bluest Sky Destinations’ , ‘Africa’s Leading Destination’ and ‘City with the World’s Cleanest Beach’ are three of these fascinating titles! * The Table Mountain National Park in Cape Town is unique: not for the amazing plants it has but for the huge number of plant species it has. With 2200 different kinds of plants, it has more species than New Zealand and the United Kingdom! Why not end with a video as interesting as the city itself? Here it is. 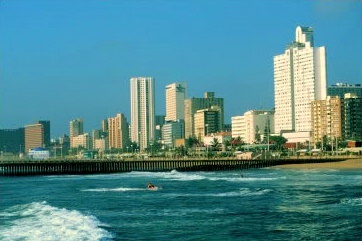 Visit this page for some interesting Cape Town pictures. And if you are interested in visiting Cape Town one day, why not make a start by looking here? Do you KNOW the Big Five? Talk of South Africa and you have to mention the Big Five: the Lion, the Elephant, the Leopard, the Rhino and the Wild Buffalo. These 5 animals rule the game reserves of South Africa. And yes, no game drive is complete without seeing all of them. Here’s an interesting video about the Big Five. Wouldn’t it be a thrilling experience to cruise past them in your jeep, stopping when you wanted? Let’s look at each of these fascinating animals in detail. Weight: About 170 kg. (About twice the average man’s weight). Diet: Carnivorous diet. Lions are opportunists. They can eat the remains of an animal someone else has killed. 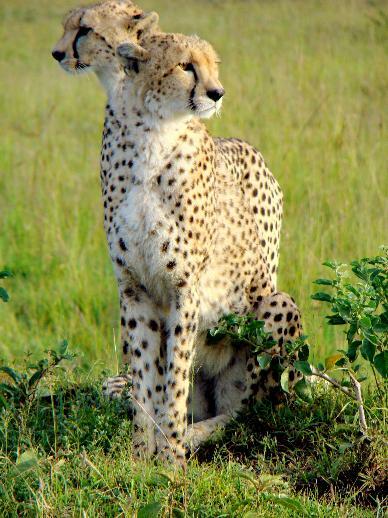 They can also hunt and eat animals ranging from the a small hare to a huge African buffalo. Life Span: Around 16 years in the wild. What’s so interesting about lions? * The roar of a male lion can be heard up to a distance of 8 km! If you live in Mumbai, that means a lion roaring at Mumbai CST can be heard at Mumbai Central! Weight: 4 to 6 tons. ( Half the weight of an 84 passenger school bus!). Diet: They graze and also uproot trees and and shrubs. And how much do they eat? 300 Kgs a day. That is about 130 times the food an average man eats in a day! Life Span: 60 to 70 years. What’s so interesting about elephants? 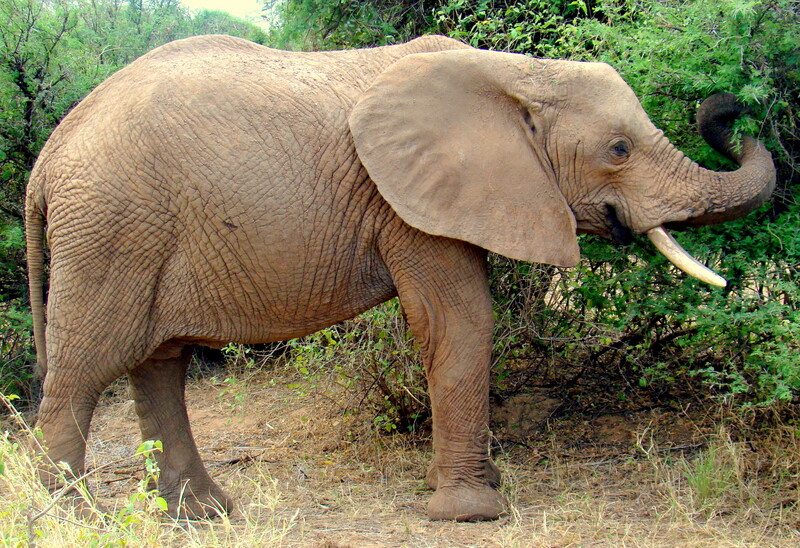 * Elephants drink about 190 litres of water a day. That’s equal to the amount of water I use everyday to bathe, wash clothes and dishes, clean my house, shave, and do everything I can! Wow. Diet: Carnivorous. It eats small animals and medium sized antelopes. What’s so interesting about leopards? 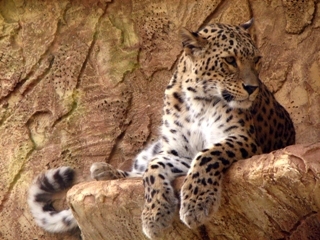 * Leopards are staunch advocates of living alone. So much so, that they actually fight any other leopard they accidentally encounter! However, they do sometimes hunt with their mate. Here’s a leopard posing for Namaste South Africa by the way. Diet: Leaves, buds and shoots of plants is what a species of Rhino called the Black Rhino eats. The White Rhino eats grass. But yes, all rhinos are veggies. Life Span: 35 to 40 years. What’s so interesting about rhinos ? * Well, we all know that the elephant is the largest land animal on earth right? We’ve learn that since childhood. 🙂 Ever wondered which is the second largest land animal? Our good old white rhino. What’s so interesting about buffaloes? Yeah, that’s what you might be wondering. Buffaloes? What’s amazing about buffaloes? But, you see, these are not our good old Indian buffaloes. 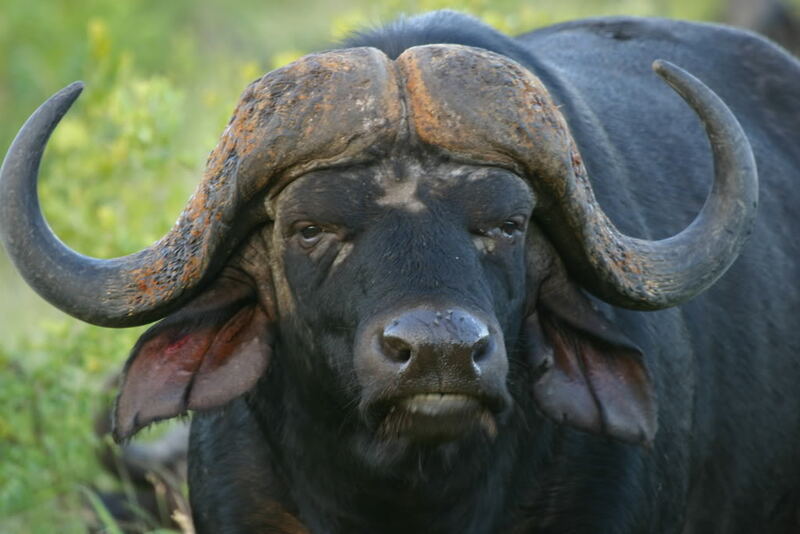 They are African buffaloes – different creatures altogether. * Buffaloes have 4 times the strength of an Ox. And if you didn’t notice the statistics, they weigh four times a lion! So well, when are you coming to South Africa? You might like looking at this fascinating page that tells you about some wild tours! Here’s dedicating this entry to the Big Five! The Namaste South Africa ‘African Animals Quiz’! Do you really know Africa’s animals well? And if you don’t know them – what’s Google for! Do what you will, but if you answer the following fascinating questions about Africa’s animals correctly, we’ll send you a free copy of “Opportunities Today” – an interesting travel magazine. It is mainly found in Kenya. Well, can you tell us which animal this is? 2 Both of these animals look almost the same, don’t they. 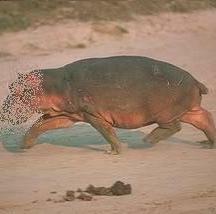 And both are found in the jungles and nature reserves of South and East Africa. One of them climb trees and one of them can’t. And one of them is the fastest land animal on earth reaching speeds of 75 mph at times. Well, which is what? 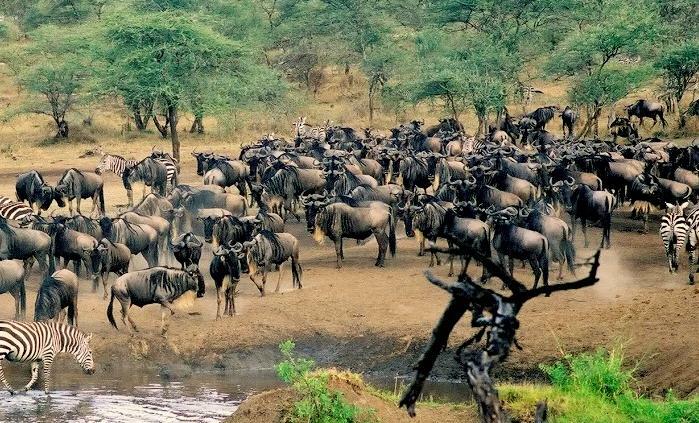 3 The Wildebeest is found in large numbers in Kenya and Tanzania. Over 1.5 million wildebeest live in this area. Wildebeest are one of the fastest land animals on earth clocking speeds of 80 kmh. But in the picture, you see so many of these creatures gathered together. What’s the big event for which all of them have congregated? 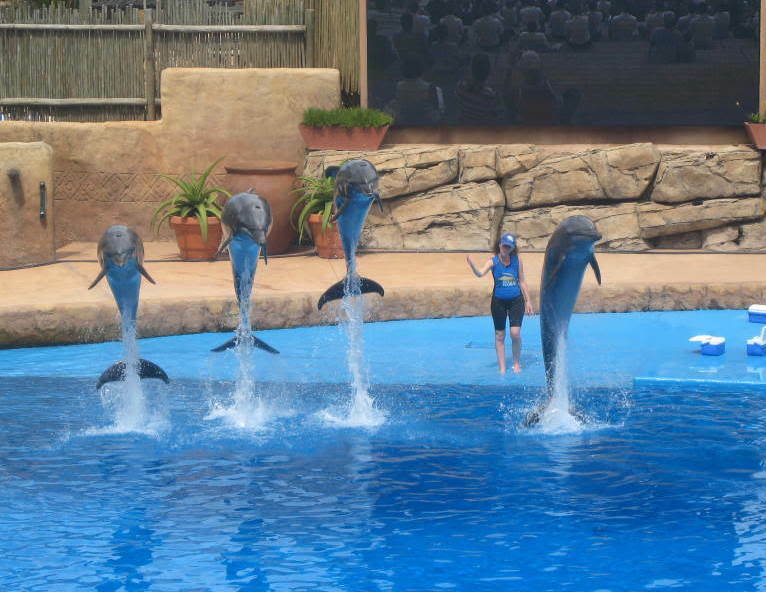 The event is one of the 10 natural travel wonders of the world. 4 You know what these animals are. They are elephants of course! But one of them is the Asian elephant and the other is the African elephant. Can you tell which is which? 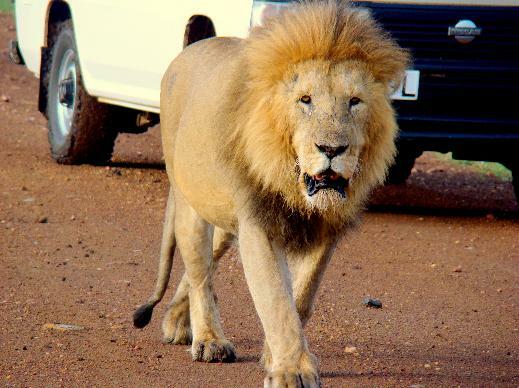 5 This interesting animal, found in Masai Mara national park weighs 15 times a full grown lion! 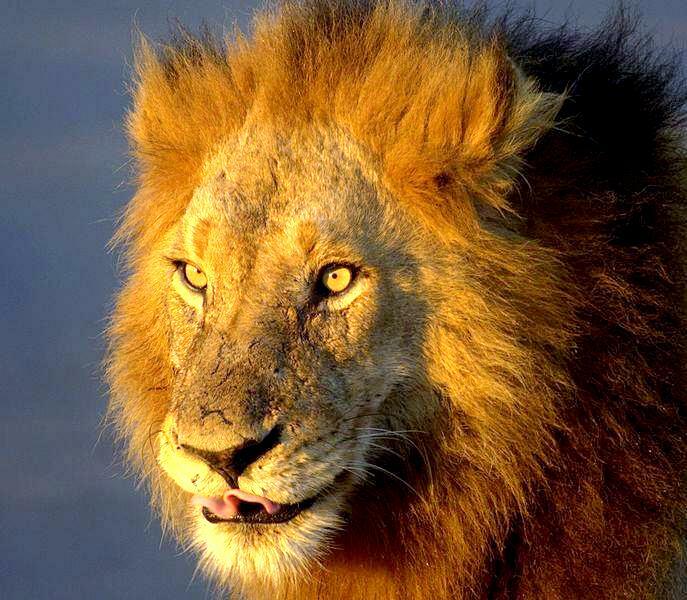 It’s average lifespan is 35 years, about 3 times that of a male lion. This mammoth animal has a dangerous fact associated with it: it causes more human deaths in a year than buffaloes, elephants or rhinos. What are we talking about? 🙂 Here’s a picture of this animal. If you know the answers to any of these questions, mail them to namastesouthafrica@gmail.com . If you get even 4 out of these 5 correct, we’ll send you our special travel magazine FREE of cost! And yes, are you on Facebook? Do visit Namaste South Africa there! You can also access the visual, exciting Facebook version of this quiz here.. This World Cup has many firsts – and pretty interesting firsts they are. Shall we take a peek at what’s happening for the first time in history this summer? 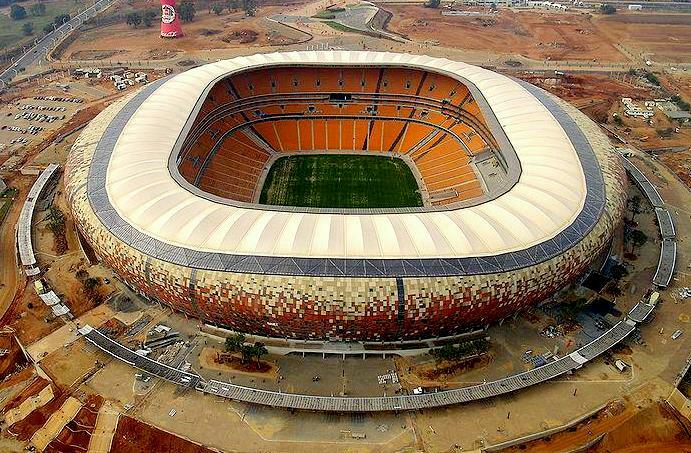 The FIFA World Cup 2010, is the first ever World Cup to be held on African Soil. 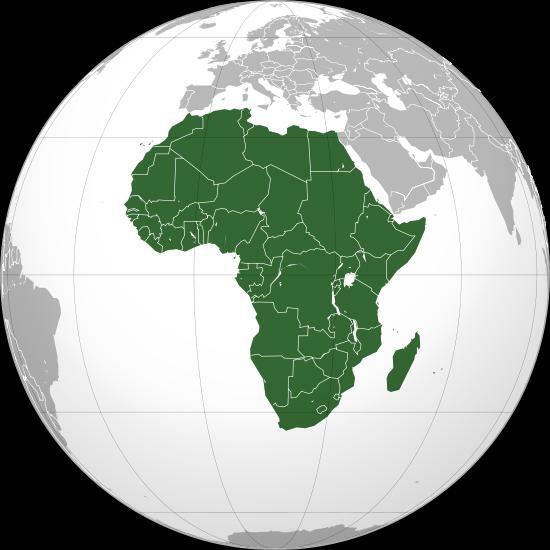 Africa was chosen as the host for the 2010 World Cup as part of a new policy to rotate the event among football confederations. South Africa competed with Morocco and Egypt and won hands down in the bid to host the Cup. For the first time in the history of the World Cup FIFA won’t choose the man of the match for any World Cup game. You and I will. Fans all over the world will text their choices or submit them online during the game. And the man who has the highest votes from “us – the people” wins! Interesting? You bet. There have been surveys before but none of this kind. CapeInfo.com has launched an online survey to better understand football fans all over the world. Why aren’t they coming for the World Cup? And if they are coming, what will be their travel itinerary? What are their concerns about the World Cup? How aware are they about South Africa? And the questions go on and on. The results will be available online for everyone to see. I don’t really understand the point of the survey but maybe it will help the organizers understand the point of view of audiences the world over. This might help in better organization of future events. A million? 10 Million? A 100 million perhaps? 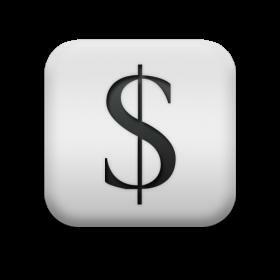 Its $ 420 million. The highest ever prize money to be awarded in the history of sports. It is also an increase of 60 percent over the last World Cup’s prize money. Everybody who participates wins a prize. In fact, each team exiting at the group stage receives $ 8 million! The same players with the exact same faces. The same stadiums. The same crowd. The same sounds. It’s so real – you’re stumped. For the first time since football was first played, a game that simulates the World Cup down to the smallest detail has been launched. EA sports has launched the 2010 FIFA World Cup Video Game. The 199 teams that took part in the 2010 FIFA World Cup Qualifiers will be in the game. Players can play against other players through online gaming services like Playstation Network or XBox Live or they can play against the computer. Movies in 3D are amazing. The effects seem so real! What if the World Cup action was brought to you LIVE in 3 D? How may “Wows” would you shout out? This time 25 of the World Cup games are going to be filled using 3D cameras. The Sony Corporation has arranged for these special cameras. Whatever else we may be unsure of, what we cannot deny is this is going to be a fascinating World Cup in South Africa. What say you?